The Carlos Santana Up Close and Personal Flyaway Sweepstakes (cricketsweepstakes.com/santana) is open to legal residents of the fifty (50) United States and the District of Columbia, who are at least twenty-one (21) years or older. The Carlos Santana Up Close and Personal Flyaway Sweepstakes ends at 11:59PM EST on October 15. During the period, visit cricketsweepstakes.com/santana and follow the instructions provided to complete the online entry form. There is a limit of one (1) entry per person per day. 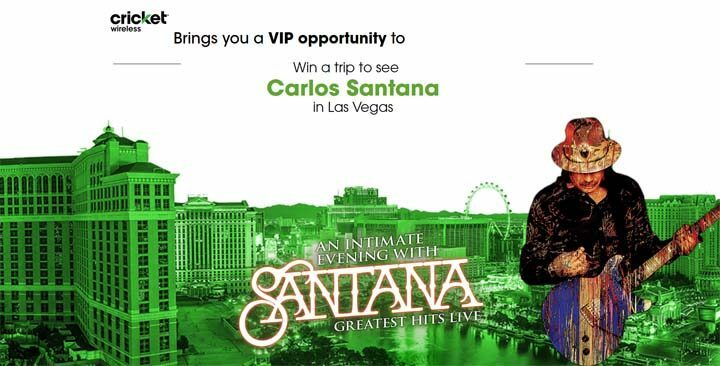 A trip for the Grand Prize winner and one (1) guest to attend the Carlos Santana concert at House of Blues Las Vegas scheduled to take place in Las Vegas, NV on November 11. Grand Prize winner and guest must travel on same itinerary. Trip consists of roundtrip, coach class air transportation from a major U.S. gateway airport nearest winner’s residence to a Las Vegas area airport, two (2) nights standard hotel accommodations from November 10-12, ground transportation to/from destination airport and hotel, ground transportation to/from hotel and Concert, two (2) tickets for a premium table at the Concert, two (2) passes for Foundation Room access at the Venue during the Concert, two (2) Concert VIP lanyards or wristbands, priority access for two (2) to the Venue’s Music Hall during the Concert, gourmet treats during the Concert for Grand Prize winner and guest, two (2) Carlos Santana limited edition art and photo packages, two (2) Carlos Live DVDs, two (2) Meet and Greet passes for use during the Concert to meet Carlos Santana, one (1) item of signed Carlos Santana memorabilia, one (1) $500 prepaid gift card, and one (1) Samsung Galaxy S8 smartphone and twelve (12) months of Cricket Wireless service with its Unlimited Plan. Approximate Retail Value (“ARV”) of Grand Prize: $5,000.00. Each First Prize winner will receive a Samsung Galaxy S8 smartphone and six (6) months of Cricket Wireless service with its Unlimited Plan, and one (1) item of Carlos Santana autographed memorabilia. Exact autographed item received to be determined by Live Nation, in its sole discretion. ARV of each First Prize: $1,500.00. Each Second Prize winner will receive one (1) item of Carlos Santana autographed memorabilia. Exact autographed item received to be determined by Live Nation, in its sole discretion. ARV of each Second Prize: $500.00.